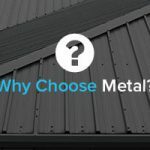 Gable roofs are a popular roofing option for many properties, with a variety of design options to select from. 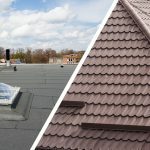 Choosing the right roof for your property is important for both aesthetics and functionality, so we’ve put together a guide to the different types of gable roofing designs here. 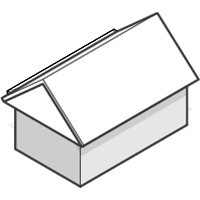 A gable roof is a common roof type used for many building designs. It will have two sloping sides that meet to form a ridge, and is most easily identified by the triangular shape formed at either end. 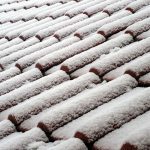 Gable roofs are an ideal design for areas with cold weather conditions as they can easily shed water and snow, however they can prove problematic in high wind areas if the frames do not have adequate support. 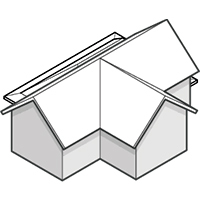 Box gable roofs have a triangular extension at each end of the house, with the roof section boxed at the end. 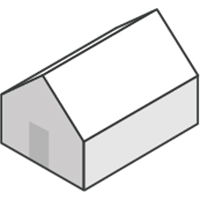 This design is extremely similar to the standard gable roof, but distinguishes the triangular section of the design more. 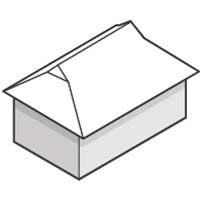 A front gable roof is simply placed at the front of the house, with the front door typically placed under the gable. This is a common feature amongst Colonial-style homes, but is becoming increasingly popular as a design. 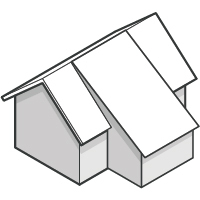 A cross gable roof consists of two or more gable rooflines that intersect at an angle, most often with the two ridges placed perpendicular to one another. 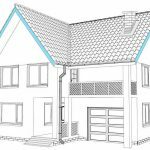 Houses with this design will often have a more complex layout due to the change in shape a cross gable roof will have on the house’s structure. For example, homes with a cross gable roof may have separate wings, a larger porch, or an attached garage. 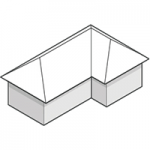 A typical alteration for an extension to an existing gable roof is to add a shed roof to the gable roof ridge. This hybrid design is a popular solution for property owners looking to extend, as it provides the opportunity for more headroom and space without having to completely alter the structure and aesthetics of the roof. A dutch gable roof is a hybrid of a gable and hip roof. 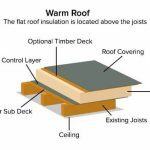 The typical design composes of the gable roof being placed on top of the hip roof, providing more space within the loft. This is a popular design with many property owners, adding an enhancing aesthetic appeal to a house as well as providing the practical function of added space. 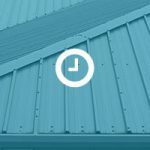 We pride ourselves on offering a high quality gable roofing design and installation service here at JTC Roofing, with our experienced team always on hand to advise on the most suitable materials and design for your requirements. 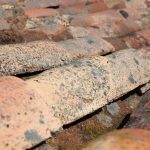 For more information about the products and services we offer, feel free to contact us today, and we’ll be happy to help with any enquiries you may have.